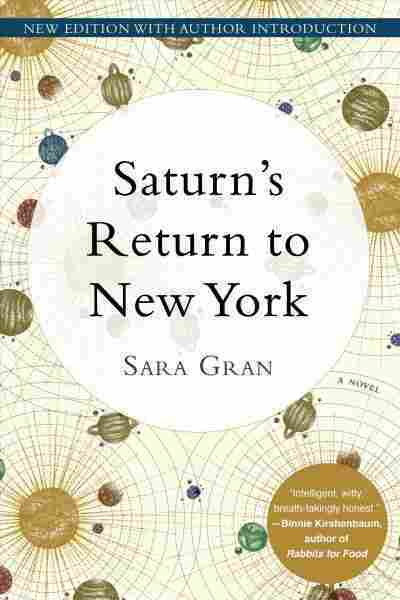 In 'Saturn's Return,' Astrology Is A Framework, But Not A Fix Sara Gran's first novel, now reissued, takes an astrological concept as the jumping-off point for a messy, prickly, realistic depiction of a difficult year in a young woman's life. In 2000, Sara Gran's prospects seemed bleak. She was 28, broke, full of frustrated literary ambition and convinced life was passing her by. She was wrong. Later that year, Gran sold her first novel, Saturn's Return to New York, newly reissued by Soho Press. Looking back, she writes in her introduction, "this feeling of dread and doom at twenty-something seems dramatic and slightly ridiculous. At the time it all felt very important and very real." By astrological standards, it was. Gran wrote Saturn's Return to New York during her own Saturn Return, which, for the non-astrologically inclined, is like a cosmic bat mitzvah, except that it happens 15 years later and you become an adult not by learning Torah, but by working through life's great challenges. But chances are, you knew that already. Nearly 20 years after Gran finished Saturn's Return to New York, astrology, like Saturn, has returned. Last January, the New York Times critic Amanda Hess wrote an article called "How Astrology Took Over the Internet," describing "astrology's return as a compelling content business as much as a traditional spiritual practice." She points to online astrologers' wide and lucrative followings, noting that "Seemingly every cool-girl online brand ... features its own astrology column." Girl, here, is key. The astrology renaissance comes from, or is marketed to, women around Saturn Return age. Maybe all this had no bearing on Soho Press's decision to re-release Saturn's Return to New York. But whether the choice was canny or lucky, it was good. Gran's debut novel is perfectly suited to the present. It's eminently relatable, but without the glaring contemporariness that marks so many efforts to relate. I couldn't stand last year's The Girl Who Never Read Noam Chomsky, whose protagonist Elle described as "an everywoman built for the twenty-first century," but I loved Saturn's Return to New York, with its protagonist built for no particular moment at all. Like an astrologer, Gran works in loose but specific strokes. Mary, her narrator, has a voice so wry and powerful it echoes in your ears. Gran is expert at social comedy, and at making rooms come alive. When she writes parties, you can smell the spilled drinks; when she writes Mary's terrible co-workers, you want to hide in the supply closet. She evokes friendship rapidly and well, especially when writing Mary's friend Chloe, who introduces her to the concept of Saturn Return. For Mary's 29th birthday, Chloe surprises her with an astrological consultation. "I coo my happiness through lunch and up the short walk to this astrologer's apartment," Gran writes. "It's cold out, and Chloe wraps her arm around mine like women do in movies." The combined tenderness and performance are spot-on. The astrologer, though, warns Mary it's time to stop performing. Time to face her own emotions, particularly where her father is concerned. This is not Mary's way. She opens the novel by reporting, "When I was seven, my father killed himself. He woke up one morning in 1977 and swallowed a bottle of Valium that my mother's doctor, ironically, had prescribed to help her cope with my father's depression. Well, the Valium helped with the stress, all right." The Hallmark risk is high, but Mary's sharp wit and Gran's quick prose keep the novel from veering into sentimentality. Saturn's not having it. Mary needs to face her grief, and fast. Her distant, glamorous mother Evelyn is developing dementia. By novel's midpoint, she needs Mary's full-time care. You see where this is going: As Mary's mother weakens, the two women mourn together, become closer, et cetera. The Hallmark risk is high, but Mary's sharp wit and Gran's quick prose keep the novel from veering into sentimentality, and her astrological fixation broadens the story from an intimate family drama to a greater coming of age. This is not to say you have to believe in astrology to enjoy Saturn's Return to New York. But Mary's astrological consults ground the novel outside her family. Gran uses the Saturn Return conceit to keep Mary focused on the question of, as Sheila Heti would put it, how a person should be. Her questions are the same she might have asked in 1969, or might ask in 2019: Would I rather be interesting or happy? How do I remain friends with somebody who's entered a life stage I haven't reached? Do I care about falling in love? In the reissued version of Saturn's Return to New York, the answer to that last question is no. There was a love arc in the original, but Gran writes in her introduction that — spoiler warning ahead — she disliked it, felt it destabilized the novel's balance, and got rid of it this time around. The change is crucial. Before, Mary emerged from her Saturn Return orphaned, but newly coupled. Now, she emerges exhausted and alone. There's no narrative of coolness or happiness here, no triumphant gloss on the ending. There's a year of hard emotional work, and the reward is that Mary gets to enjoy her own company a bit more. This means the novel's not a good pitch for astrology as life fix. Mary's Saturn Return changes her slightly, if at all. It's not what Internet-beloved astrologer Chani Nicholas would call "Something that will help you come into a deeper appreciation of all you are capable of." Instead it's a bad year, rendered with bravery and prickly grace. Gran offers messy, halting, stutter-step emotional development — a process to which anyone, astrology lover or no, can relate.